Height: 5 feet on sides, 6 feet at the apex. With hinges (sold separately) it fits between a 4ft 5.25 inch opening. The best selling Estate Swing Driveway Gate Collection is now offering a matching garden gate! This classically designed garden gate panel compliments your Estate Swing Driveway Gate and offers easy pedestrian entry and exit. With an elegant sweeping arc and clean lines this garden gate adds the final touch to your property while meeting your desired entry needs. The design incorporates classic artistry, sturdy wrought aluminum alloy and a smooth powder coated finish. 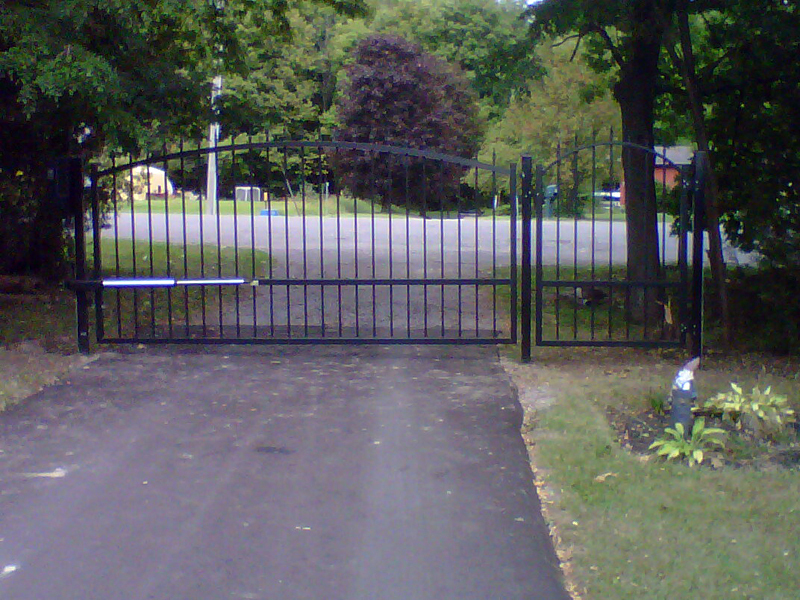 Its well constructed frame allows for optional accessories like the GateCrafters.com Professional Grade Electric Pedestrian Gate Lock. You can even automate the lock and garden gate with a push button, keypad, intercom, telephone intercom, GSM cellular intercom or remote/receiver combo. 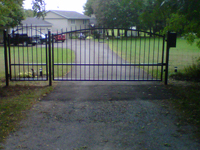 Additionally, by using wrought aluminum as the base metal instead of steel it creates a stronger lighter weight gate, which in turn, is safer for people and pets. Estate Swing sought to anticipate the needs of consumers and incorporate those details when designing this dynamic driveway gate. Therefore, it’s easy to drill, easy to lift and easy to install which keeps both the DIY installation effort and cost down significantly. One other unique factor about our Estate Swing Garden Gate is that its made in the U.S. by skilled welders which follow the American Welding Society's Standards. Keeping the manufacturing local allows for efficient quality review and substantially quicker shipping time compared to overseas outsourcing. With all of these features and benefits another company would charge a much higher price, but because GateCrafters.com has a special relationship with Estate Swing, we've decided to pass the savings on to you! Each Estate Swing Garden Gate comes standard with finials and end caps, depicted in the image above. However, you do have the option to upgrade your finials (and replace the standard) by selecting from the related items offered below. Additionally, price is for gate only: bolt on hinge plates or posts sold separately. As mentioned above it can also be outfitted with a pedestrian gate lock. 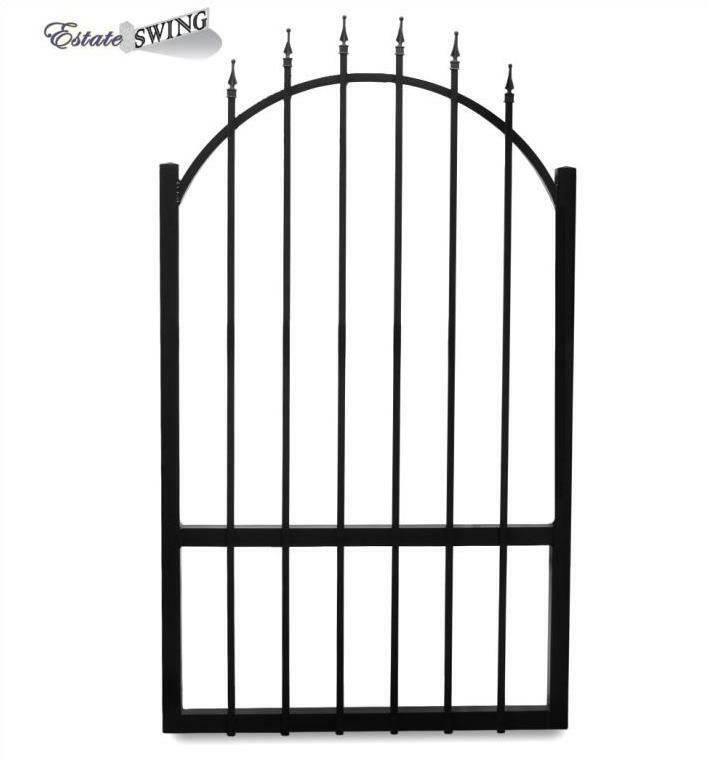 The Estate Swing Garden Gate is supported by the full frame and entire collection of thicker than average pickets. 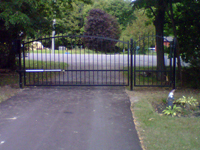 Many customers seek to lock and/or automate their garden gate, so Estate Swing designed the gate panel to easily and effectively achieve this goal. Powder coating is the process by which powdered pigment is applied to and cured on a surface. It consists of a mechanical and/or chemical treatment of the surface to remove impurities and contaminants followed by the application of the pigments. Then the material is cured at high temperatures which makes the pigments flow together and react chemically to form the coating. Powder coating is preferred for certain surfaces because it creates or contains close to no volatile organic compounds and does not sag or run with thicker coats. The overspray can also be recycled so there is little waste, making it less expensive and creating less hazardous waste. Our Estate Swing Garden Gates are each powder coated to provide the most uniform appearance possible. All of the Estate Swing Garden Gates come with a limited lifetime warranty. This warranty is provided by the manufacturer for structural integrity against defects in materials and workmanship.